I’ve written about plotting before, but over the past year my thoughts on the subject have evolved, so I thought I would revisit it. When I first started writing The Woodlander, I was firmly in the “just wing it” camp. the main reason being I wanted to avoid the dreaded “paralysis-by-analysis” effect, where if I didn’t plan out every last detail ahead of time, I wouldn’t even be able to start writing. Far better, I thought, to just jump in and let the plot come naturally. Fortunately, the plot did come to me, but that process (or lack thereof) also resulted in some substantial rewrites and edits! There were dead ends that had to be scrapped, new ideas that had to be seamlessly worked back in, themes that needed developing, and so forth. Still, there remains the problem of working out the entire plot before you even begin. For instance, as I wrote The Woodlander, I really didn’t know what was going to happen to poor John Grey, and even if I had tried to plot out the details ahead of time, I was worried that it would come out forced and contrived. So, with this in mind, I’ve taken a hybrid approach to plotting with the sequel Grimm & Grey. It’s split into two story arcs: one involving John Grey and his continued quest from the first book, and the other following Lisa as she begins to attend classes at snooty Langley Prep, all the while learning she can’t hide from her past (read this last part in dramatic movie-announcer voice). The first arc is very much in the vein of The Woodlander, an epic adventure with over-the-top action. I’ve already completed this arc, and I wrote it much like I did the first book – making it up as I go. Of course, along the way I had some some general idea of what was going to happen, but for the most part I just let it rip. I like writing in this fashion – it’s very liberating, and it gives you an opportunity to surprise yourself! That’s all good and well, but now I had to write the second arc involving Lisa. This one is interwoven with the first through alternating chapters, so it was clear some planning would be necessary. Passage of time, for instance, needs to be consistent. I can’t have weeks pass by for John Grey in one chapter while mere hours pass for Lisa in the next. The two need to intertwine tightly, and come back together in a satisfying conclusion. As trite as it might sound, I think the original Star Wars movies are a great model for this. Particularly The Empire Strikes Back, where we follow Luke on his quest to become a Jedi while simultaneously following Han and Leia as they run from the Empire. 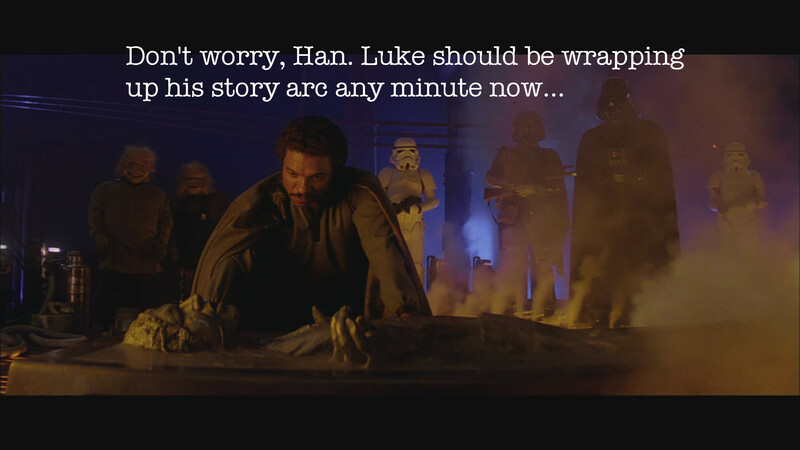 The two arcs come back together in a satisfying (if tragic) conclusion, with the gang reunited at the end (albeit sans Luke’s hand and Han’s carbonite-encased body). One of the great advantages of this dual-arc approach is each story can have a different style and feel. Can you imagine an entire movie of just Luke learning to be a Jedi? It would be great for a little while, but how many objects do we need to see him levitate before we get the idea? As a stand-alone concept, it’s not nearly as interesting, but when you simultaneously have Luke’s friends getting captured by Vader, and suddenly Luke has to abandon his training to try and save them… well, now I have to know what happens next! 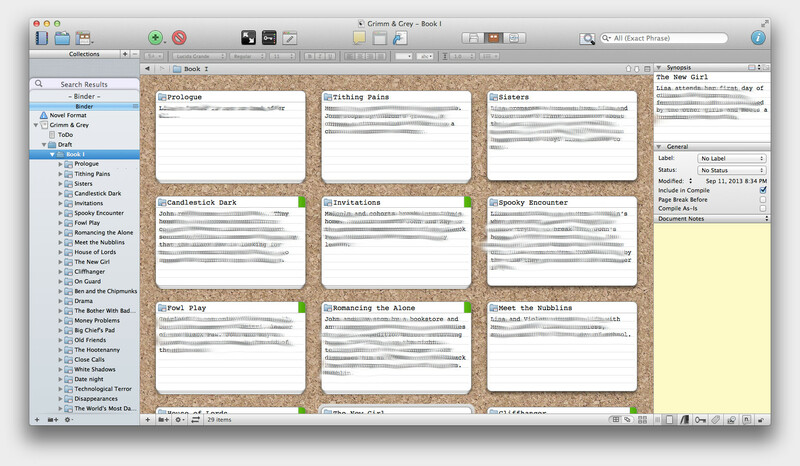 Scrivener allows you to create a synopsis for each chapter and lay them out as notecards on a virtual cork board. You can then drag the cards around to reorder events as you like. I’m finding this feature extremely useful as I try to integrate Lisa’s story arc around John’s. As I stated before, John’s half of the book is already complete. For each chapter in this arc, I created a notecard containing a synopsis of that chapter. I then placed blank notecards in between the existing ones to start plotting out Lisa’s own adventure. The advantage here is I know exactly how many new chapters I need to write, how much time needs to pass in each chapter, and when I need to start wrapping things up to bring everything back together. I have to say, if I was just winging this part of the book, it would probably come out a mess, requiring extensive rewrites to blend it all back in! When you see the plot laid out on notecards, lulls in the story are revealed. Over the last year, I’ve become a firm believer in “always raising the stakes,” so it’s easy to see when a chapter ends without a compelling reason to go to the next. I’m not saying every chapter needs to be a nail-biting cliffhanger, but they should each leave the reader wanting more. For example, I noticed a few chapters in Grimm & Grey that left me saying, “Well, that’s all very pleasant, but who cares? I just want to know what happens next!” While others are so chock-full of twists and turns that they could easily be broken into multiple chapters. By splitting/combining these, I should be able to make each more compelling in turn. This is the sort of thing that’s hard to spot without an outline view. As much as it pains me to say it, creating a synopsis of each chapter is looking more and more like the smart thing to do. It really gives you a perspective on your work that’s hard to reproduce when you’re down in the weeds of your own prose. Now, whether you create that synopsis before you’ve written a single paragraph or after you’ve completed the entire book is up to you. For me, I’m doing a little of both. This entry was posted in Writing and tagged fiction, self-publishing, writing, writing novel fiction. Bookmark the permalink. When I was younger, I was more of a “pantser.” However, in working without an outline, I discovered that my stories lacked plots and wandered aimlessly (and eventually into my recycle bin). My characters weren’t fully fleshed out and they didn’t have their own voice. They all sounded the same. I always thought that working with an outline would stifle my “creative process” and trap the characters into particular roles. I discovered the exact opposite when I finally did break down and outline a story, especially when juggling multiple character arcs. I also discovered that an outline is necessary when writing screenplays. Less time for dilly-dally. I liken it to budgeting time or money—I feel more freedom within my self-imposed restraints than outside of them. I know that I’ll reach my goal if I try to stick with the plan. Although, there are times when you have to tell the plan to shove it and you go with the flow. Things might become a tad wonky for a bit, but your story (or your life in general) can be far more interesting when you take the scenic route. Maintain a healthy balance. I agree that working within a budget can be liberating. Once you stop pursuing things you don’t really need, you can focus on enjoying the abundance you already have. I plan out the general framework and major elements of a book, but I make sure to leave enough holes to let the story’s momentum fill in details organically as I write – letting the characters feel themselves out, so to speak. I’ve yet to use a fancy notecard program for outlining; I just keep a free-form text document for all ideas pertaining to the whole work, then do a bullet-point list of events prior to writing each chapter/section. In any case, I’m looking forward to seeing what all’s in store for Grimm and Grey!